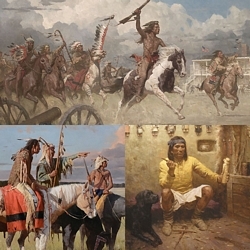 Image Size: 24"w x 38"h.
Bears were respected by the Blackfoot as fearsome creatures and great fighters; through spiritual interaction with bears, the Blackfoot received great powers. "The Bear Spear" carried the grizzly’s medicine and its owner was a greatly respected and powerful member of the tribe. At the death of the owner, this power or medicine was handed down to his son or someone worthy to possess it. With the ceremony and the story of its origin, these became one of the most valuable of the recipient’s possessions and made known only upon special occasions.